Durable goods disappoints, the people were not purchasing the big ticket items. Spending on homes dropped, existing, new home purchases declined at a time in the summer when they are suppose to be doing well. The bubble is popping, traffic is drying up. 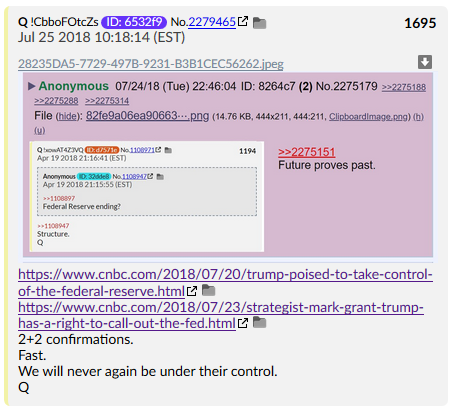 Trump wins trade war with the EU, the reshaping of the central banks has begun. The new GDP numbers are out and they are not what they seem, there was a big revision to make it look like the economy is doing well. The White House begins put procedures in place to remove the security clearance of certain individuals. Illegals are being reunited with their families, but not all because they do not have parents in the US. 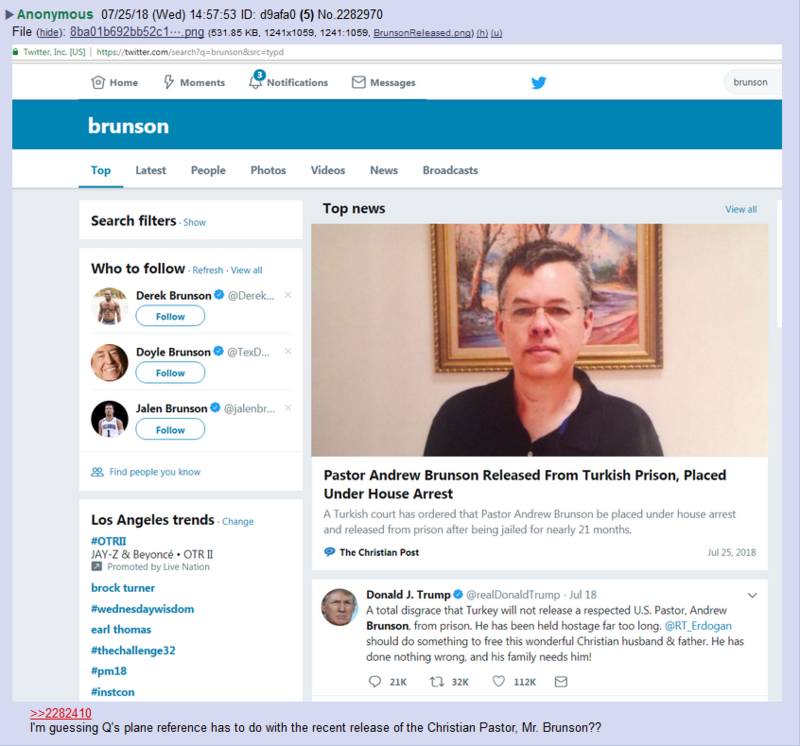 Twitter was caught shadow banning, this is a practice of hiding search results and many companies use this to hide certain information from the public. North Korea is returning the remains of the soldiers. Syria finds weapons at the White Helmet base. 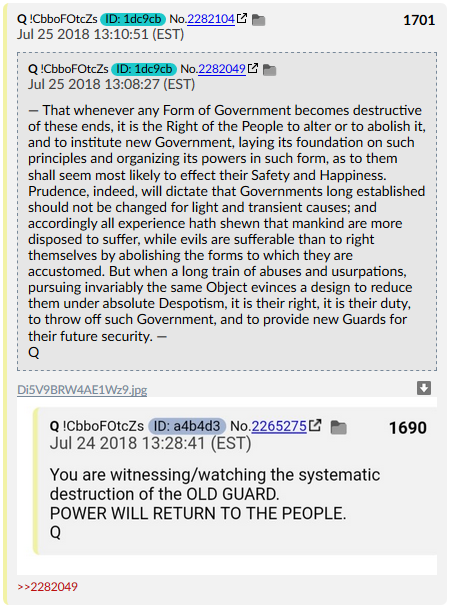 Q has dropped more bread crumbs and Q has confirmed the central bank the way we know it today is going to change. After two months of declines, Durable Goods Orders were expected to rebound handsomely in June… they didn’t. As sales dipped, so too did the total amount spent on real estate. 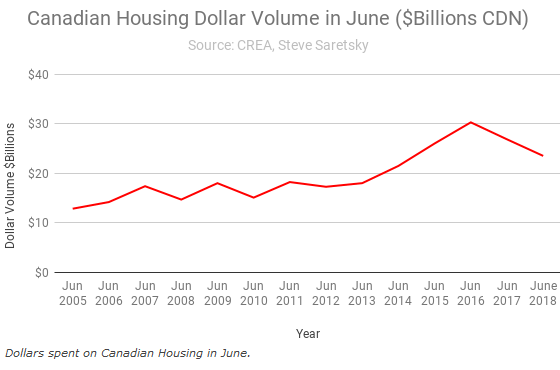 The total dollar volume dipped 12% year-over-year in June, totaling C$23.5 billion. A tough blow to government tax coffers which have reaped record sums of property tax dollars in recent years. June’s 6.7% surge get revised lower to just 3.9%, but June tumbled 5.3% MoM (well below expectations). 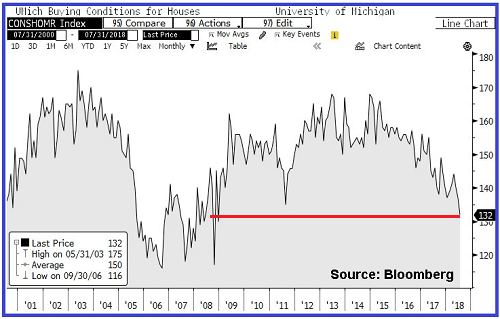 This is the biggest MoM drop in New Home Sales since Dec 2017… and this follows a plunge in Housing Starts in June. Demand weakened in three of four U.S. regions, including a 7.7 percent drop in the South, the largest area. The decline in sales left 301,000 homes available nationwide in June, the most since March 2009. The existing and new home sales reports this week were worse than everyone expected. Given the statistical manipulation tools used by the National Association of Realtors (existing home sales) and the Census Bureau (new home sales) – both entities use the same regression software – one can only wonder about the true rate of home sales decline. President Donald Trump on Wednesday won concessions from Europe. “We want to further strengthen this trade relationship. We agreed today to work together toward zero tariffs, zero non-tariffs barriers, and zero subsidies on non-auto industrial goods,” Trump announced at a press conference on the White House lawn Wednesday. 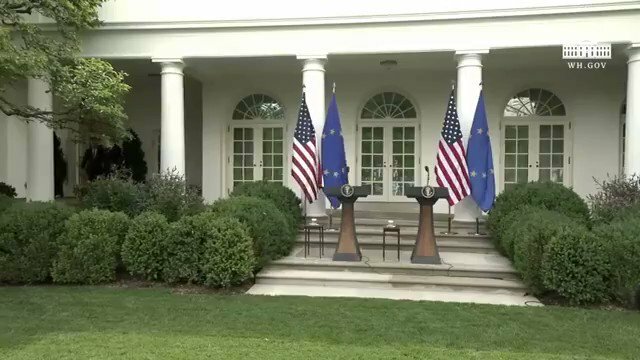 Trump met with European Commission President Jean-Claude Juncker Wednesday to discuss trade. The agreement on soybeans could offset China’s attempt to harm U.S. farmers by subjecting them to tariffs. China has been the biggest market for U.S. soybeans. one aspect of today’s GDP report that was largely ignored, was the wide-ranging revision to historical data that the BEA released alongside the latest numbers. What it showed was a doozy: on a chained (real) dollar basis, the US economy was estimated to have reached a $18.5 trillion level in Q2 2018. Putting this number in context, the last pre-revision number was $17.37 trillion as of Q1, which has now been revised to $18.3 trillion. This means that the BEA has “revised” the US economy to be $1 trillion higher, which while generally arbitrary and likely involves fudging the deflator, will mean that US debt/GDP just dropped significantly. White House Deputy Press Secretary Hogan Gidley told reporters aboard Air Force One traveling to Joint Base Andrews in Camp Springs, Maryland, that the administration has begun taking the necessary steps to revoke access to classified information from former top intelligence officials but declined to get into specifics. US government lawyers in a document filed a few hours ahead of a court-mandated deadline said 1,442 migrant children over the age of five have been reunited with their parents. A US federal court gave the government until end of day July 26 to reunite all migrant children that were separated from their parents as the result of the Trump administration’s “zero tolerance” immigration policy. 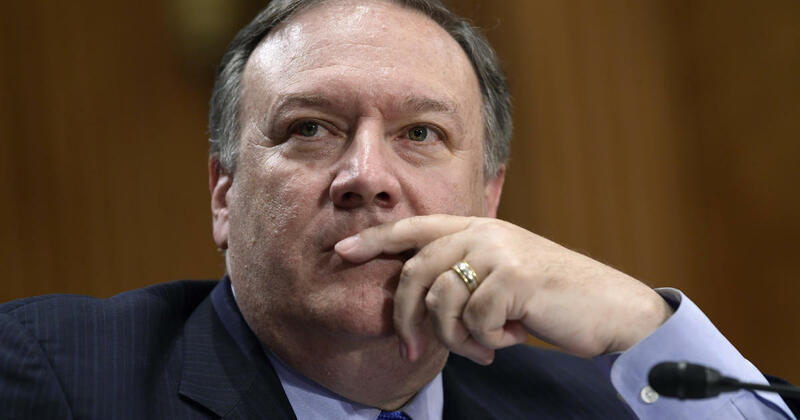 North Korea will transfer the remains of an unspecified number of soldiers killed in the Korean War on Friday, after accepting about 100 wooden caskets sent by the United States. The Syrian authorities have released the first photos from the White Helmets base that was uncovered by the Syrian Arab Army (SAA) in southwest Syria this morning. t is still not entirely clear why these weapons were stored inside of this White Helmets base; however, a local source told Al-Masdar that the explosives could have been stored in the base after the Islamic State (ISIS) took over the town. 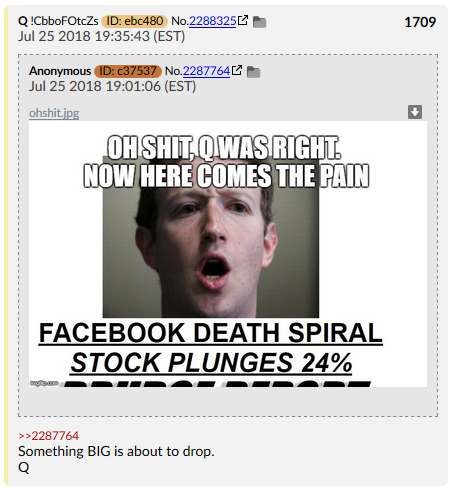 Because Q just followed it up, big-time. Grant says if the Federal Reserve continues raising interest rates it will slow down economic growth. 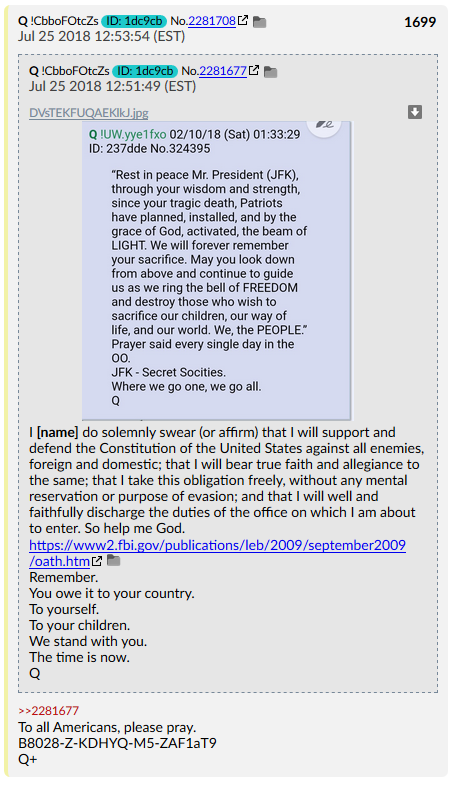 The 2 + 2 confirmations which Q references are, I believe, his two previous posts about the Federal Reserve (which I posted in the previous article), and the two news articles you see before you. I can’t wait to see what specific course of action Trump ends up taking. No R’s, no X’s, no T’s, no Z’s. Not so sure this is a message to us, but to all the good men and women working throughout the intelligence community. I’m not sure what the marker signifies. You would think “the time is now” would refer to something in the present, but he’s been saying it since November – so I don’t think that’s it. There’s also nothing, as far as I can see, thematically connecting these drops, and nothing with the timestamps. 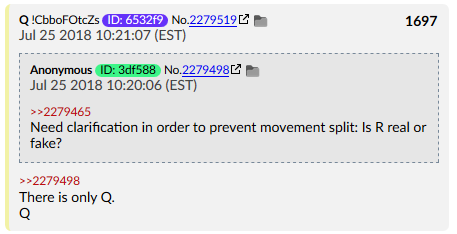 My best guess is that it’s some kind of operational signal in relation to “the plan” we’ve talked about before; Q’s Grand Plan, if you will. 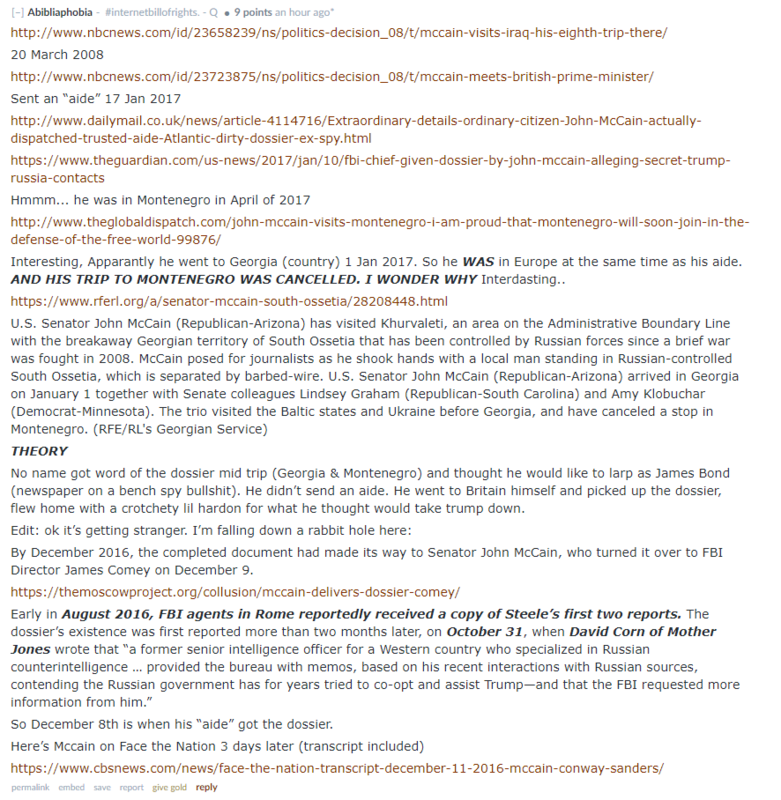 Now, we can speculate as to what events causes these timetable shifts in the past, but I think you’ll see the most recent one very clearly at the end of this article. Pray for the speedy and safe release of this man, if you would. 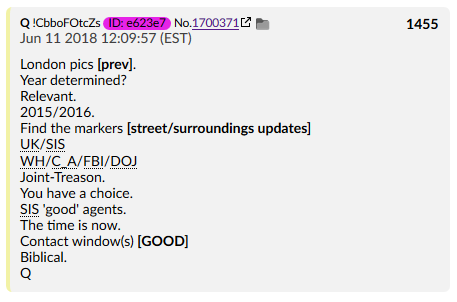 What’s REALLY staggering, however, is that Clowns tried to use the stringer as a setup for a False Flag, but were called out by Anons who were quicker than them. 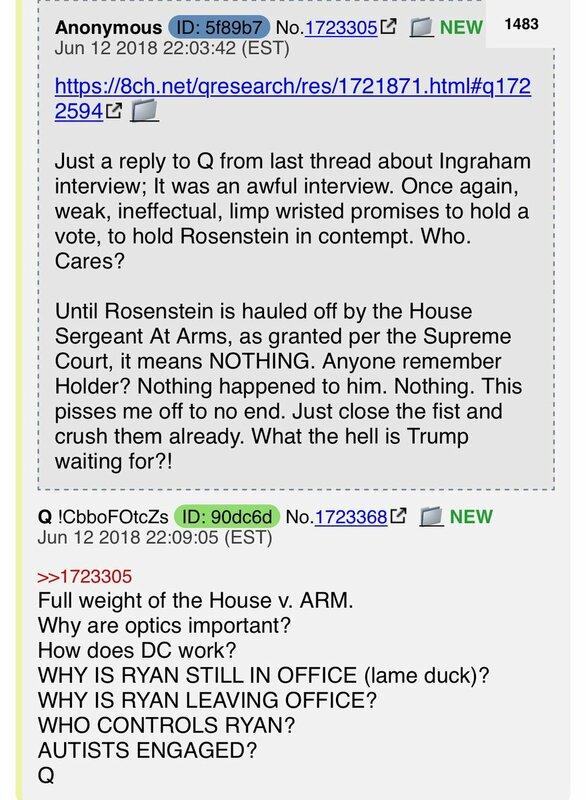 What anon did here is search for the stringer on youtube, and timestamp his post with no results as proof that no such video with that title existed. Later, a Clown posted a youtube link to a video with a Tel Aviv skyline in it. 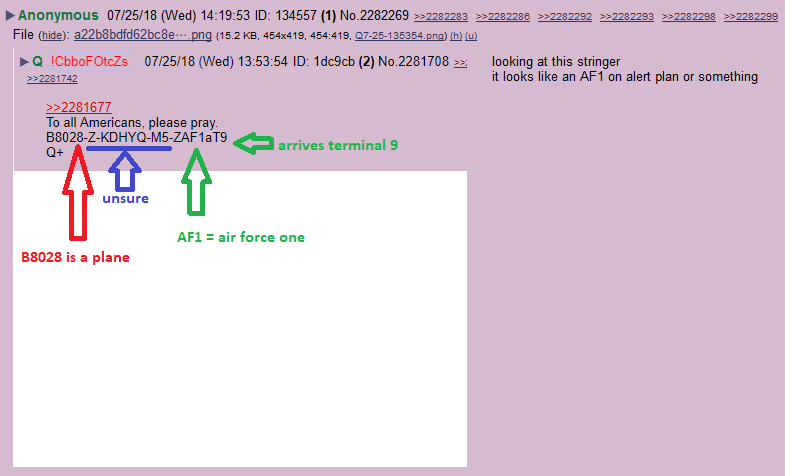 Good job, anon. You might have saved lives with this post. 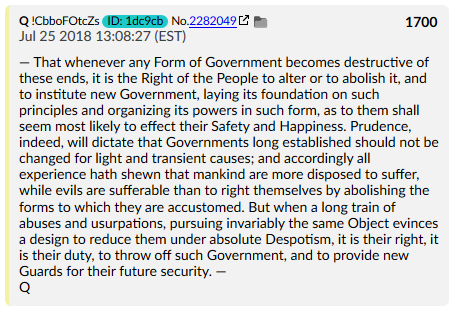 Q’s quoting from the Declaration of Independence, in case that wasn’t clear. We’re “throwing off” such a Government, and providing new Guards for our future security. Now here’s the story I was talking about; the potential impetus for such a “timetable shift,” because we had a binary outcome here: the EU could either agree to no tariffs, or they could disagree and force POTUS to use tariffs. 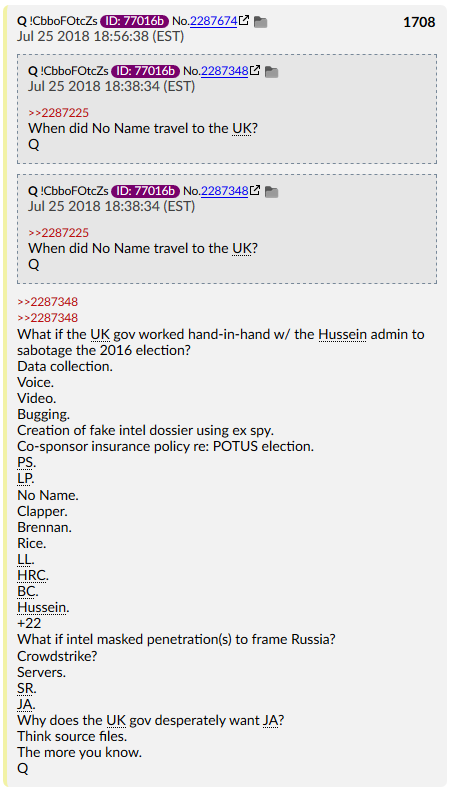 In planning out Q’s Grand Plan, QTeam needed to account for both outcomes. That’s just speculation on my part, but I think you can see where I’m coming from. Unfortunately, I could not find a source that had clear enough audio to determine the actual questions that were shouted at him. You hear several voices in the clip #POTUS tweeted, but their words are faint and unclear. Likewise, every other source I watched of the Rose Garden announcement was also too unclear. I did attempt to isolate the audio track from the cleanest source I could find, and clean it up a bit further, but it’s still very hard to hear. I get bits and pieces of words, like the female reporter yelling, ‘DO YOU NOW ACKNOWLEDGE [unintelligible] PAYMENT…” But that’s about it. 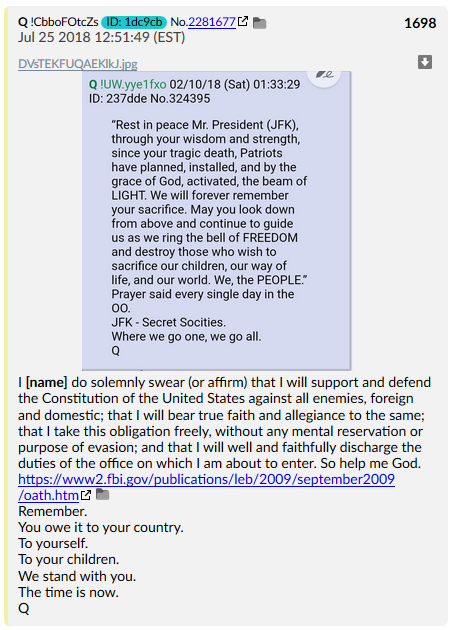 Maybe you guys will have better luck sussing this out or finding a cleaner source. 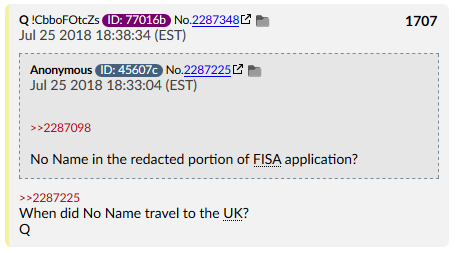 Q says “RUSSIA DELAY IN MEETING PUTIN (DC),” but I can’t hear the full question in regards to that. Regardless, his point is that the MSM isn’t our friend. 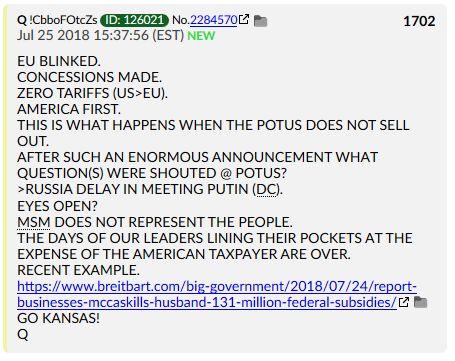 Sen. Claire McCaskill’s (D-MO) husband’s business dealings have received $131 million in federal government money, according to a report. It’s a nice gig, if you can get it, right? Pffft. 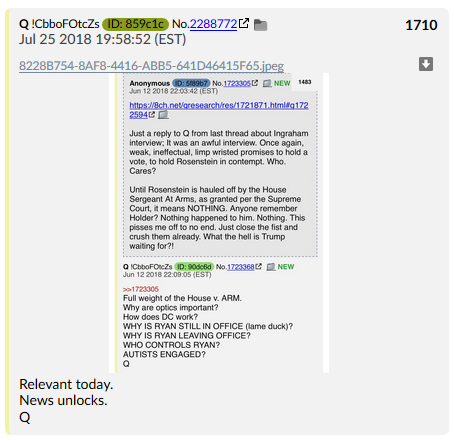 When can we lock these criminals up, Q? 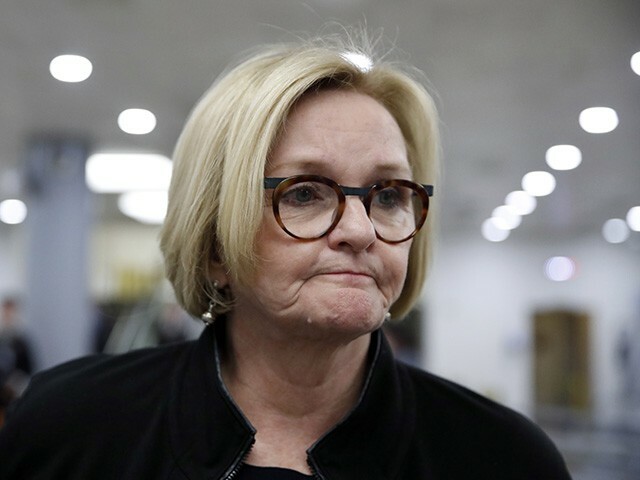 McCaskill is considered to be one of the most vulnerable Democratic senators up for re-election in 2018, since her state went for President Trump in the 2016 presidential election. The most recent Real Clear Politics (RCP) average of polls places McCaskill with a one-percent lead over her Republican opponent, Josh Hawley—which is within the margin of error. I think Q is signalling that she won’t be able to win this; not this time. Let’s hope the right guy wins this time. His responses to Booker and Menendez are particularly notable. (They’re both towards the very end). 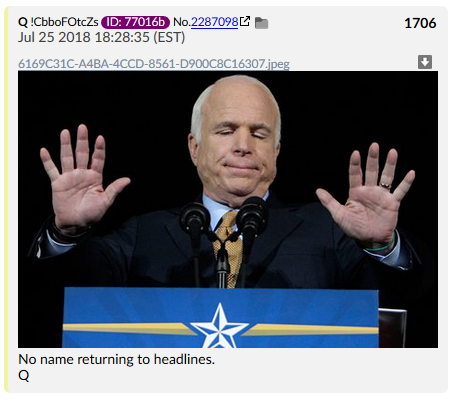 Think his “cancer” has come back yet? I’d still like some kind of solid date confirmation, but this is some solid speculation. 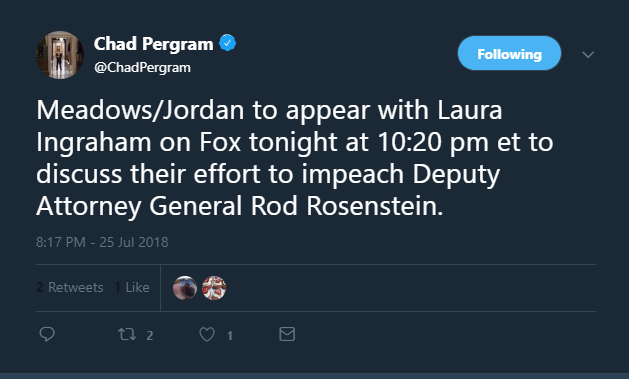 Well, they’re certainly trying to get him. 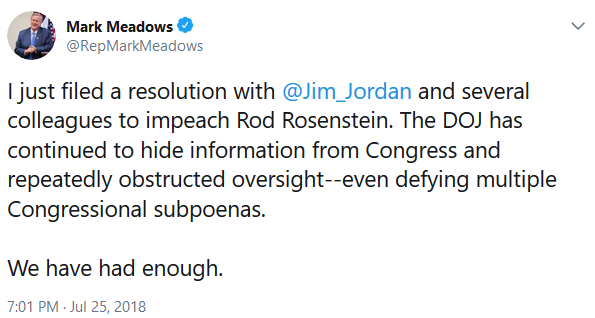 I don’t think POTUS will allow that to happen. The news unlocks in about an hour (as of this writing). Stay tuned! Big things are happening – with EVEN BIGGER THINGS to come!